XAU/USD dropped to $1310 during yesterday's session however remained in positive territory supported by a sharp fall seen in the 10-year US T-bond yield, following worth than expected ISM Non-Manufacturing and Services PMI figures. However the greenback is not loosing ground especially ahead of Powell's speech today which is expected to be positive after a strong NFP report. 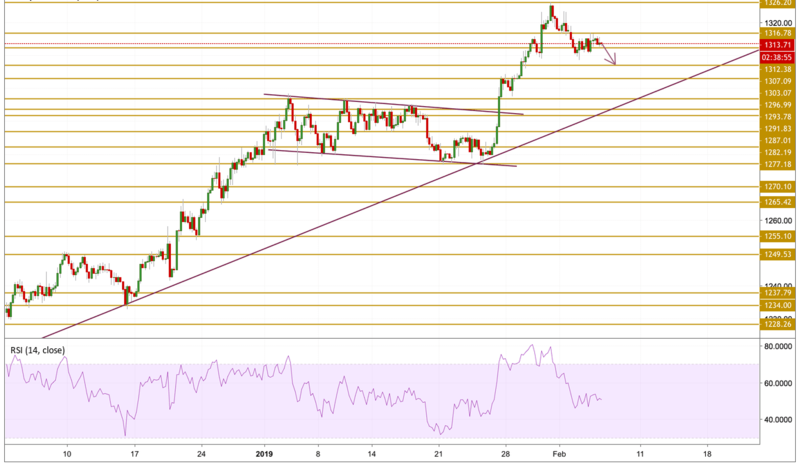 Gold prices managed to stay in the green during yesterday's session after finding support from the $1310 area but the precious metal is facing another wave of sellers that kind of let it enter into a consolidation phase with a bias to the downside. The price is currently hovering above the $1312.38 support level but the momentum is still bearish and we expect a downward move. We will be focusing on the $1307.09 support level.